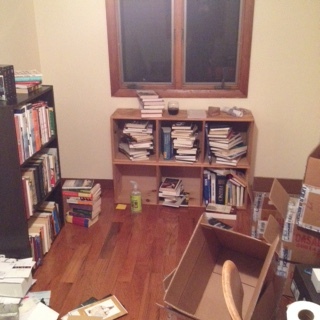 After I move, I always set aside a chunk of time for my books. Sometimes it’s a morning project with a pot of strong coffee. This time I found myself with a free Saturday night, some red wine, and a hankering to feel settled. For all literary people I know, whether readers, writers, or librarians (in my case, all of the above), this process is sacred. There are so many different ways to organize, so many ways to prioritize. Books, for some of us, are old friends, companions, memory triggers, solace. My mother doesn’t understand the urge to own books. Borrowing them is plenty for her. Tonight, while sorting and alphabetizing, I remembered again why borrowing is not always enough for me. Some books are so important that I need to be able to go back to them again and again, not only to the book but to the self I was when I met the book, when I jotted marginalia (in pencil—still a librarian), when different sentences or ideas stuck with me. 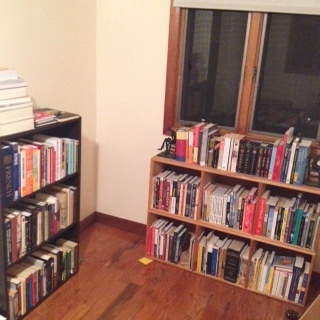 Organizing my books takes me hours. I settle in with my coffee or my wine and slowly decide how I want them arranged. This time they’re broken mostly by genre, then subgenre if necessary, author or editor last name, and in the case of multiple books by one author finally alphabetized by title. I pause as I go to leaf through the pages and reacquaint myself with them, to remember when they came into my life and how they changed me. —Phillip Lopate, “Modern Friendships,” in Getting Personal (New York: Basic Books, 2003), 166. What wonderful timing, Caroline! As I get ready to move — and place most of my books in storage for a little while — I’ve been thinking a lot about books and my relationship to them. Glad yours are settled into their new home now. That always makes such a difference! Good luck with your move, Melissa! It’s amazing how much “home” is wrapped up in books. I’m sure yours will miss you, but I’ve no doubt that the reunion will be even sweeter for the separation.